Before recruiting a general you must first build a Headquarters. You can then use some of your gold to recruit a general. Name your general once you have recruited him. You won't be able to move your general until you assign him some troops. To do this, move soldiers who are currently defending your village to your general. 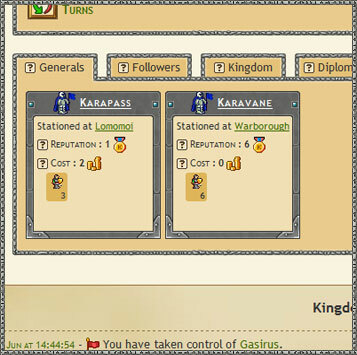 After assigning troops to your general, you can move him using the Map. It may take some time before your general reaches his destination, but you can cancel his journey if you change your mind. Once your general reaches a location which isn't part of your kingdom, he can attack it. If the location is being defended, a Battle will commence. Tip : Each upgrade of your Headquarters will allow you to recruit an extra general. For example, if you upgrade your Headquarters to Level 3, you'll be able to control up to 3 generals at once. During battles, you will see an increase in your general's Reputation . The reputation of a general corresponds to the number of unpaid units he commands. For example, a general with 20 units and a maintenance cost of 12 will have a reputation of 8 . Warning : Conquering numerous locations without leaving troops to defend them or taking time to stablise trade may lead to bankruptcy.